To sum it up, writer David Raether has had a colorful career. When he was newly married, he bartended at a comedy club where he became friends with Tom Arnold, who later hired him as a writer for hit comedy Roseanne. David worked on the iconic show for 111 episodes, all while living in a beautiful L.A. home with his wife and eight children. Then, in the mid-2000s, it all came crashing down. He lost his home to foreclosure and his family broke apart. He became homeless. Since then, David has rebuilt his life and is now a frequent contributor to our blog. His straight-forward, witty thoughts and recommendations will be sure to make you revisit old favorites or add films you've never watched before. Depending on the day, he might be writing about spectacular car chases or Hitchcock’s leading men. 1. At what age did you realize that you had talent as a writer, and how did you decide to pursue it? I pretty much decided to be a writer when I was in high school. I remember telling my best friend about this and he immediately became suspicious that there was something wrong with me. (He might have been onto something there, to be honest). In college, I was an English and philosophy double major, and I edited the college newspaper and literary journal. After college, I started working as a journalist. In the early '80s, a friend of mine and I started a magazine together in Minneapolis. We didn’t have any money for this project, so I got a job bartending at a comedy club in order to pay my rent. 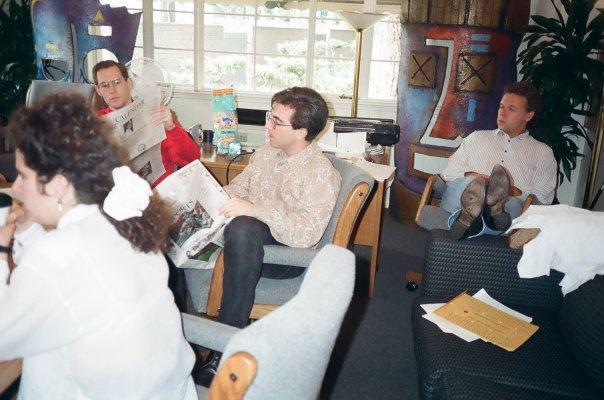 I became friends there with Tom Arnold, and in the early '90s, he asked me to join the staff of Roseanne. David in the writers' room of Roseanne. 2. What was the first movie you ever saw, and did you and your friends/family have any movie night traditions? The first movie I saw in a movie theater was Robinson Crusoe on Mars, a really terrible 1964 sci-fi movie about an astronaut stranded on Mars. I saw it at the Terrace Theater in North Minneapolis, and I loved the entire experience. My parents weren’t much for the movies, so I didn’t really start watching lots of movies until I went off to college. The school I attended is located in the West Bank neighborhood of Minneapolis. There was a revival house there and the playbill changed almost everyday. This really is when I started to see movies from all sorts of eras and from around the world. I miss revival houses. 3. Describe the extraordinary life situation you've had of being a writer on Roseanne to becoming homeless to climbing back. After Tom Arnold gave me the big break of hiring me onto to Roseanne, I was fortunate enough to work for a total of twelve years as a TV writer. Because of some health issues my wife was dealing with, I decided to step away from that career in the early 2000s for a couple of years. When I decided to return to TV writing, the industry had changed and employment opportunities had dried up dramatically. In the ensuing years, I was unable to find work, we lost our home to foreclosure, our family broke up and I ended up homeless. I continued writing, however, moving more toward non-fiction and web content. In 2013, an essay I wrote, “What It’s Like To Fail,” was published on a small San Francisco website called Priceonomics.com. It caused a huge sensation, and was republished around the world. I have since written a memoir about my experiences that I am attempting to sell, along with a couple television scripts. 4. If you had to write a screenplay about your life, what genre would it be and who would you pick to star in it? I actually have written a screenplay about my life. Trying to sell it right now. It is a dark comedy/melodrama. Believe it or not, I think Brad Pitt would be the right person to play it, not because I look anything like him but because I think he could handle the combination of wisenheimer and beaten down person that I have been. I’m a pretty sarcastic person and sharp-edged, and I think Brad Pitt can play that very well, as well as the struggling person trying to hide his disappointment but being resourceful. I just sense that Brad Pitt is a person who has had more troubles than he lets on and could play that aspect of my character well. 6. What's your favorite movie quote? My favorite speech from a movie is from It Happened One Night, written by Robert Riskin. Late in the movie, Clark Gable and Claudette Colbert are staying in a cheap motel in New Jersey, pretending to be married but sleeping chastely in separate beds with a large blanket hanging between them. I saw an island in the Pacific once. Never been able to forget it. That’s where I’d like to be able to take her. She’d have to be the sort of girl who’d jump in the surf with me and love it as much as I did. You know, one of those nights when you and moon and the water all become one and you feel like you’re part of something big and marvelous. That’s the only place to live—where the stars are so close over your head you feel you could reach up and stir them around. 7. If you were stuck on a desert island for the rest of your life, but were given five movies to watch, which five would you choose? 8. Any interesting trivia/anecdotes about yourself? I have eight children (one wife, no multiple births), including six daughters. Whenever anyone asks me why we had so many kids, I always say that it wasn’t for any religious or philosophical reason; we were just irresponsible. All the kids complained when they were growing up that on the weekends I would make them watch what they called “weird, foreign movies.” Now, they appreciate that I did this. Grudgingly. I will watch any kind of movie and can appreciate each movie on its own terms. For instance, I think one of the best screenplays of all time is the one for Die Hard. It’s a masterpiece of plot structuring. I also watch The Bicycle Thief almost once a year. It never fails to break my heart. I think that’s the greatest movie ever made.